Nice Healthy lean angle! What spikes are you using, coldcutters? Seen a couple of films where they use those, seems like youre getting pretty good edge grip, what is the name of those 'screws'? 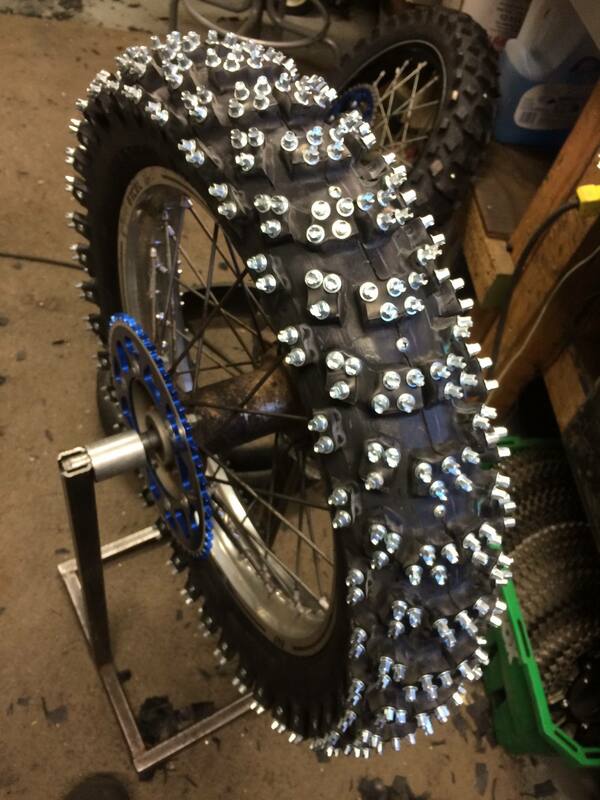 In sweden (and Finland duuh ) we use 'finndubb', which translates to finnish spike tyres, the go-fast ones, nasty sharp spikes if you run into a fellow rider, but its how the race rules currently are. Last edited by TomTom; January 30th, 2019 at 08:33 AM. And my favourite choice of weapon. Last edited by TomTom; January 30th, 2019 at 08:53 AM. Its not functional now, too warm. Possibly sunday as its supposed to get cold tonight. Even at the national race I was to attend sunday (Årsunda) its 5cm of water at this moment. Theyre still positive race will happen, they have some massive resources there. No riding in Gnesta, what you were asking for in the first place. Last edited by TomTom; March 8th, 2019 at 09:23 AM. Attended the Swedish national ice-track race of 2019 at Årsunda. (Same lake as 'Speed Weekend'). Engine worked perfectly with no issues and excellent power, however fun power is, in this type of racing cornering quick is way more important than power. This was the first ride of the season on the Berg and there was no time to try any adjustments prior to the race, so I had to make some educated guesses. Most worked ok, but I didnt feel confident with the front end. I used the Berg fork on the KTM training this year and was very happy with it diving into corners, but the same fork on the Berg not so much. So I need to look into what is differing between the bikes to get the same feeling. I did however manage to sort the lack of grip starting and coming out of corners that I had last year, it was biting almost too much now, but I dont see that as a problem, if I get to ride it a couple of times more I will adjust to that. All in all another fun day on the Berg and good racing.